Dearest Jesus, Lord, Thank You so much for everything that energizes my hunger for you. For all the trials, pain, hurt, sorrow, and struggles in life. Lord, these really mold me to become a better, stronger and more righteous person in Your sight. Most of all, thank You for the unstoppable blessings You’ve given to me. I give thanks for my dearest family, friends, relatives, and for all the people that surround me. Lord, You are the reason why I am still alive and breathing Your presence. 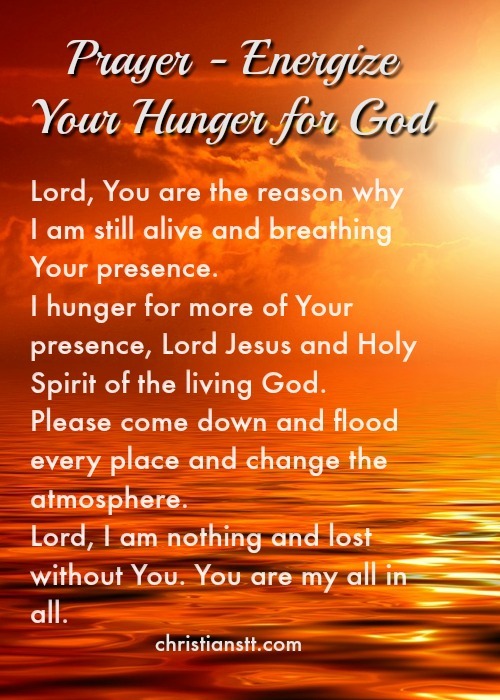 I hunger for more of Your presence, Lord Jesus and Holy Spirit of the living God. Please come down and flood every place, and change the atmosphere. Touch the hearts of every person in this world, Lord, I am nothing and lost without You. You are my all in all. Psalm 63:1O God, You are my God; I shall seek You earnestly; My soul thirsts for You, my flesh yearns for You, In a dry and weary land where there is no water. hunger for Your Holy Presence, God. I am complete with Your true love. I will be forever grateful, thankful and excited that I will know You more and more each day of my life until the day will come that I will see Your face closer and I will hug You tight and kiss You in reality. Thank You Lord Jesus Christ, I am truly forever Yours and You are forever mine. I love You with all of my fighting heart and soul. Amen! John 7:37Now on the last day, the great day of the feast, Jesus stood and cried out, saying, “If anyone is thirsty, let him come to Me and drink.